Feeling full involves more than just the uncomfortable sensation that your waistband is getting tight. 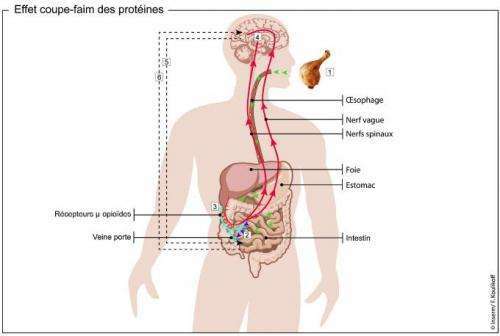 Investigators reporting online on July 5th in the Cell Press journal Cell have now mapped out the signals that travel between your gut and your brain to generate the feeling of satiety after eating a protein-rich meal. Understanding this back and forth loop between the brain and gut may pave the way for future approaches in the treatment and/or prevention of obesity. Food intake can be modulated through mu-opioid receptors (MORs, which also bind morphine) on nerves found in the walls of the portal vein, the major blood vessel that drains blood from the gut. Specifically, stimulating the receptors enhances food intake, while blocking them suppresses intake. Investigators have now found that peptides, the products of digested dietary proteins, block MORs, curbing appetite. The peptides send signals to the brain that are then transmitted back to the gut to stimulate the intestine to release glucose, suppressing the desire to eat. Mice that were genetically engineered to lack MORs did not carry out this release of glucose, nor did they show signs of 'feeling full', after eating high-protein foods. Giving them MOR stimulators or inhibitors did not affect their food intake, unlike normal mice. Because MORs are also present in the neurons lining the walls of the portal vein in humans, the mechanisms uncovered here may also take place in people. "These findings explain the satiety effect of dietary protein, which is a long-known but unexplained phenomenon," says senior author Dr. Gilles Mithieux of the Université de Lyon, in France. "They provide a novel understanding of the control of food intake and of hunger sensations, which may offer novel approaches to treat obesity in the future," he adds. 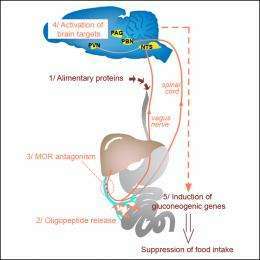 Intestinal gluconeogenesis is involved in the control of food intake. We show that mu-opioid receptors (MORs) present in nerves in the portal vein walls respond to peptides to regulate a gut-brain neural circuit that controls intestinal gluconeogenesis and satiety. In vitro, peptides and protein digests behave as MOR antagonists in competition experiments. In vivo, they stimulate MOR-dependent induction of intestinal gluconeogenesis via activation of brain areas receiving inputs from gastrointestinal ascending nerves. MOR-knockout mice do not carry out intestinal gluconeogenesis in response to peptides and are insensitive to the satiety effect induced by protein-enriched diets. Portal infusions of MOR modulators have no effect on food intake in mice deﬁcient for intestinal gluconeogenesis. Thus, the regulation of portal MORs by peptides triggering signals to and from the brain to induce intestinal gluconeogenesis are links in the satiety phenomenon associated with alimentary protein assimilation.